Naperville is the fifth most populated city in Illinois and was rated one of the best cities for early retirement in 2013, and Secure Data Recovery is proud to have an office in Naperville for our clients. 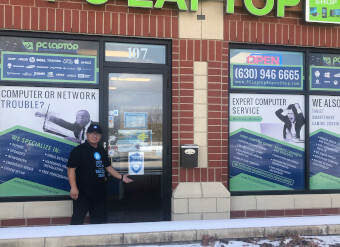 We have been providing the residents of Naperville with outstanding data recovery and computer forensics services for years. We are dedicated to retrieving your lost files and data. Secure Data Recovery Services maintains a 96% overall success rate, an A+ Rating with the BBB, and an SSAE 18 Certification. Secure Data Recovery is your local data recovery and digital forensics solution. We provide our clients with flexible options and specialized services for any file loss scenario. Our skilled technicians have years of experience, and we invest in state-of-the-art technology to make sure our customers receive the best service and most reliable results. Secure Data Recovery also provides digital and computer forensics services. Our engineers in Naperville have decades of experience and are prepared to assist our customers with any type of digital forensics case. Some of the most common cases our Naperville engineers work on daily are computer forensics, cell phone forensics, audio/video forensics, and many more. Many digital forensics cases are unique to our clients’ situations. Our technicians are able to work with our clients to deliver the most effective results. Call our customer support team at 1-800-388-1266 to get started on your digital forensics case today. Secure Data Recovery is a company you can trust. We hold more certifications than any other data recovery and digital forensics company. Our routinely audited certifications are posted on our website for all of our clients to read. We take the security of your information seriously and, for that reason, we follow strict security protocols. Here is a list of some of our certifications. Most businesses and individuals are not prepared for a device failure. Device failure can mean unexpected downtimes, substantial data loss, and other severe consequences. The first thing you should do is completely power down the device and remove any power source. Shutting off the device can potentially prevent further data loss. Never try to repair the device or recover data from it yourself. Our engineers have over 20 years’ experience with drive failures and can safely repair and recover your data. Attempting to recover data on your own can lead to permanent data loss. Secure Data Recovery Services provides Bethesda, MD with fast and secure data recovery and digital and computer forensics services. Our advanced technologies and decades of experience allow us to recover data from any type of media and, if the need arises, to analyze and document the information for a digital forensics report. Call our customer service team today at 1-800-388-1266 for a free consultation. Our outstanding customer support team is available 24/7 and 365 days a year. When you call, ask about our no recovery, no charge guarantee. Chris McMacken was very helpful with me. Answered all of my questions fast and was very professional to work with. So I was that person that thought an external hard drive was indestructible thus felt very proud of myself to have all of my photos since digital cameras came out nicely organized on the external hard drive. Never thought about having multiple forms of back up. The night before headed back to work after a year long maternity leave, I took out my hard drive to upload a photo of my kids to put on my computer desktop in hopes to make my first day a little more bright. I then heard the 'click of death'. The tears started flowing and I laid awake night after night thinking I had lost 20 years of photos...family, friends, trips, wedding, babies, etc...Fortunately, the IT people at the school I work at told me about companies that have a 'clean lab' where they can ideally retrieve data. I felt hope! I did a google search and chose Secure Data Recovery because of its top ratings and reviews that others wrote. Many mentioned that they had excellent communication with their costumers. I found that appealing as I am not tech savvy (obviously) and wanted to be able to ask questions and such. I worked with Frederick A. Wright and he was quick to respond to my questions and let me know about each of the steps in the process. I was shocked with the price but I am paying for a service that I cannot do myself and there is greater risk to have retrieval done elsewhere. Now that I have all my photos returned on an external hard drive, I need to set aside time to back it all up again in multiple spots! While I hope this doesn't happen to anyone I know, if it does, I will be sure to recommend Secure Data Recovery! Secured Data Recovery helped us recover critical information for one of our customers. I wish there were faster ways to recover crashed hard drives as it took almost 10 days to get the data back. I am very satisfied with the service provided.